I first started paying attention to what Stan Lee was saying outside the comic books in the early-to-mid 1980s. I was starting to read up on and study the history of comics, particularly the Fantastic Four and Marvel. Lee had long been THE go-to comic book celebrity, so it wasn't all that difficult to find interviews and articles about him. With my initial focus on and interest in the FF, though, I paid a little more attention to Lee even as I began broadening my scope. Jack Kirby, too, of course, but Lee tended to be more out-spoken. One thing I've found fascinating is watching Lee over the past quarter century. He's frequently asked the same questions over and over again, and he has a pile of stock come-backs and anecdotes. But what's struck me as how they've morphed over the years. I recall when he first started trotting the notion that he'd told these anecdotes too many times; he said something to the effect of, "I've been telling these stories for so many years now, but I don't know if they're really true. I figure there must be some aspect of them that is, though, otherwise they wouldn't be good stories for me to tell." That's gotten truncated over the years and these days he spits out something more like, "I've told these stories so many times, they're true." You can see how he got from one to the other, but if you only heard the recent version, you'd wind up with a substantially different interpretation. So here come Danny Fingeroth and Roy Thomas with The Stan Lee Universe. Although it's very much about Lee, it's not a biography like Tom Spurgeon's book. It's a collection of articles, interviews, remembrances and ephemera that are collectively used to build a portrait of Lee. Much of it comes from Lee's personal archives, so it's in his own words, but unlike his autobiography, there isn't several decades of poor memory and self-aggrandizing hyperbole getting in the way. This is Lee telling his story as it happened. I have to admit that I had some concern when I first came to the book. I'm pretty familiar with Lee's life and career, having read quite a bit about him over the years, and I thought that another book on the man might just wind up being a somewhat repetitive fanfare for him. I think he's contributed quite a lot to the comic industry, to be sure, but I also tend to think the credit he's given, while not wholly unjustified, does something of a disservice to many of the other great comic creators who did so much for the industry. While there is some unabashed gushing about Lee in the book -- primarily in the new interviews with Lee's old colleagues -- there's much more focus on presenting things in fairly straight-forward manner. The book is organized in a more-or-less chronological fashion, starting with a 1957 interview and running through to Who Wants to be a Superhero? and The Traveler. Many of the archive pieces are rare, some of which I had never been aware of, much less seen. 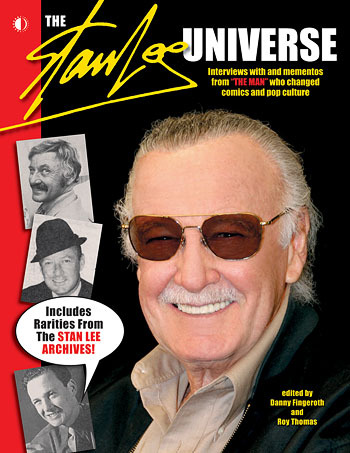 All of which paints a picture of not only who Stan Lee is, but how he got to be who he is over the past 50 years. You can follow some of the subtle changes in his demeanor and attitude from one interview to the next, where he attributes credit and when. If you're one of those folks trying to piece together just what the hell was going on at Marvel in the early 1960s, this goes a long way to detailing that. Honestly, this is a book I wish I had twenty-five years ago. There's a lot about Lee in here, naturally, and by extension there's a lot about the early days of Marvel Comics. I'm sure that most comic fans will find something decidedly new and interesting in it; I've been reading about Lee for decades and got some new insights out of it. It's really well put-together and organized, with lots of rarities that I would've assumed were long since lost to time. Definitely worth picking up if you have any interest in Marvel or comics history in general!